Why do I still have pimples? Quick treatments, home treatments, overnight or miracle treatments and spot creams. You’ve tried it all and followed various remedies by yourself. If pimples still continue to be a problem then maybe it’s time you took your skin seriously. Let me bust the myths right away by telling you that pimples are not a result of you eating chocolates or having high calorie diet or because you don’t wash your face five times a day! Pimples arise due to blocking of the opening of oil glands or overproduction of oil in the glands. This can result due to hormonal changes (most commonly seen in puberty), stress or growth of bacteria in the secretions. Steroid based creams if applied long term on face can also result in pimples which require different line of treatment. Since these glands are located mostly on face, chest and back, pimples occur in these areas. So here is a Acne Face Map: Pimples are not only a teenage problem but can occur in adults also as hormonal changes can take place anytime. Most of the parents neglect this disease in teenagers by saying that it’s age related and will subside with time but the truth is that pimples have known to have a deep psychological impact on a teenager’s life. If not treated, they leave brown spots and scars (pits) on the face which requires aggressive treatments later in the future and are more difficult to treat that just a pimple. Be prepared for a 3-6 month treatment plan which will be good enough to treat existing pimples and get long term control of oily secretions. Pimple treatments involve multiple approaches from creams, tablets and peels to using correct soap/face wash. The creams usually are combination of drugs which control oil production and open the blocked oil glands (E.g. tretinoin/ adapalene). Creams also come in antibiotic and benzoyl peroxide combinations which kill the bacteria causing pimples.These treat existing pimples, brown spots, control oil secretions and open the blocked pores. If there is a hormonal root cause for pimples, that should be evaluated and treated as well. For example, pimples can be associated in females with irregular menstrual cycles. For scars (pits), a more aggressive treatment plan is required such as strong peels, lasers or derma roller. Retinoid (eg: tretinoin/ adapalene) creams/gels Dries out the secretions, controls oil production, opens clogged pores. Applied night time. Oral contraceptive pills To control hormonal imbalance in women with irregular cycles and acne. Avoid thick creams on areas of pimples as they block the pores. You can moisturize your skin using water based moisturizers. Avoid massages or bleaching. Go for gel based facials if required. Avoid scrubbing your face as this can irritate oil glands and result in more pimple formation. Use a mild face wash. Salicylic acid containing face wash reduces the oil secretion. Harsh soaps dry your skin which in turn causes a re-flux of extra oil production by oil glands. Avoid picking on the pimple. This leads to irritation of that area which could leave a brown spot after healing. Avoid applying anything on the face after combing your hair especially if you have dandruff. Can I apply makeup to conceal that Red Hot Pimple? Zits can pop-up over night and be a stress especially if you have a party or social event the next day! 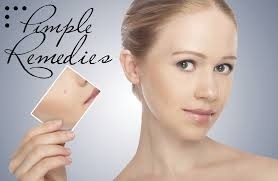 Pimples and blemishes can be concealed making you feel less self conscious. Remember to moisturize your skin before applying makeup to prevent your skin from drying. You should handle the painful pimple very gently without much rubbing to prevent irritation. Powder based makeup reduces the chance of blocking the pores. Use a light liquid based foundation matching your skin color which is “non comedogenic”. As a rule, never sleep with your makeup on. Use a gentle cleanser to remove the makeup. This will prevent further breakouts. To prevent infection from spreading, use disposable applicators whenever possible. Last but not the least, stay away from steroid based creams which are often present in over the counter skin lightening creams (E.g. Betnovate). Their long term use will result in pimples. So don’t wait and start you pimple treatment today for a smooth, healthy and blemish free skin!